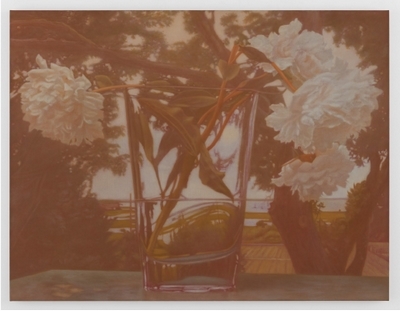 Oil on linen, 37 1/8 x 48 inches, 94.3 x 121.9 cm. Kasmin presents an exhibition of new works by MATVEY LEVENSTEIN, on view at 293 Tenth Avenue. Matvey Levenstein’s work depicts scenes from his life on the North Fork of Long Island and explores themes of history and representation. The paintings speak to the relevance of Romanticism in the 21st Century, and act as quiet meditations on the immigrant experience filtered through the most traditional painterly genres: the landscape, the still life and the portrait. Imbued with a distinctly literary sensitivity and sincerity, the exhibition brings together a selection of new works ranging in size and materials, including large sumi ink drawings, and smaller, delicate works realized on linen, copper, and wood. This is the artist’s first solo exhibition at the gallery. Matvey Levenstein’s interest in sites that have a largely unexplored historical significance has led him to old pilgrim cemeteries and to views towards Gardiners Bay. Beginning with snapshots, Matvey Levenstein is able to quickly capture a scene’s formal properties before beginning his material investigation. Working with a limited palette on toned grounds, Matvey Levenstein’s distinctive compositions are characterized by the layers of paint built up and scraped back slowly and meticulously over many months, and their foregrounding of nature in all its dramatic variety: the looming power of a stormcloud, tree branches dissecting a winter sky, and more quietly, a vase of cut flowers sitting on a dinner table. In Pink Moon (2018) a tiny orb hangs amidst a luminous sunset as two telephone poles, resembling crucifixes, emerge tentatively from the bottom of the picture plane. Working in the lineage of landscape painters such as Caspar David Friedrich, Matvey Levenstein is at his most consciously Romantic in Storm (2018), which foregoes an easily intelligible subject matter in favor of the psychological intensity of a semi-abstract seascape. In other works in the exhibition, the artist’s wife makes a cameo, dressed in a bathrobe while watching an approaching storm (White Bathrobe, 2015). In another cinematic image, she appears in profile against winter fields (LY, 2018). As in Friedrich’s iconic Wanderer Above The Sea, the decisive interruption of the landscape by the human body serves to put the unintelligibility of nature into context, locating it in contemporary life. This sincere engagement with nature, combined with the prevalent cinematic aspects of Matvey Levenstein’s work, call to mind radical 20th-century filmmakers such as Andrei Tarkovsky and Ingmar Bergman. Viewed together, the striking, poetic imagery of the works can be interpreted as ‘scenes’; diaristic flashes of a potential nonlinear narrative. MATVEY LEVENSTEIN was born in 1960 in Moscow, U.S.S.R. and lives and works in New York City and Orient, NY. He received his M.F.A. at Yale School of Art, New Haven, CT, after attaining a B.F.A. from the School of the Art Institute of Chicago, Chicago, IL, and the Moscow Architectural Institute, Moscow, U.S.S.R. Matvey Levenstein teaches at the School of Visual Art, New York, NY. He will be included in the forthcoming publication “Landscape Painting Now” by Todd Bradway.